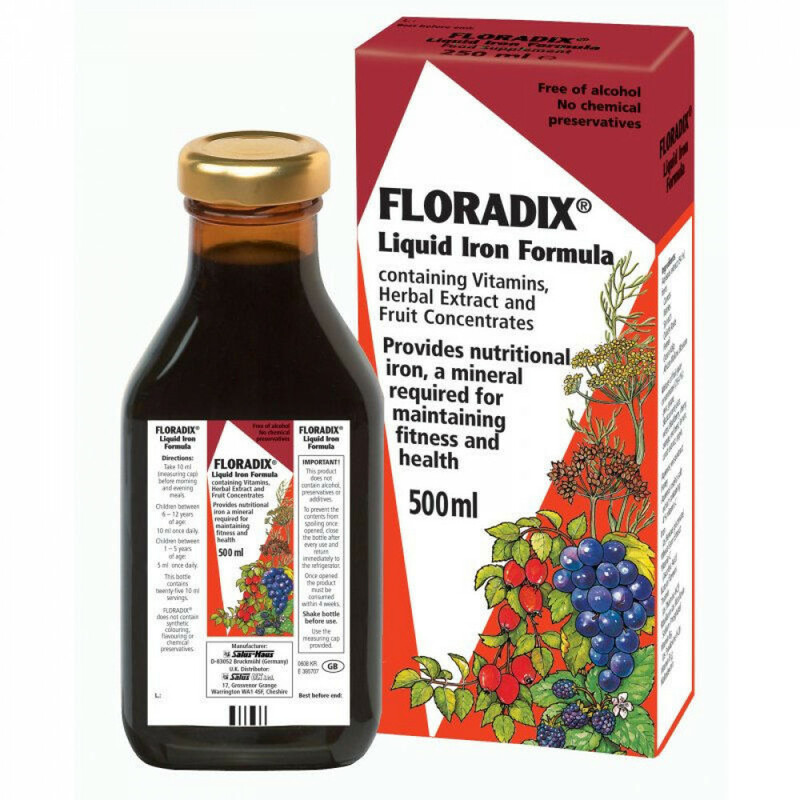 Floradix Liquid Iron Formula is an effective and nutritious food supplement that is known to provide Organic Iron, fruits, extracts of carefully picked herbs, Vitamins, Ocean Kelp and also, specially cultured yeast. Additionally it is said to contain extracts of Rosehips and Wheat Germ. Floradix is safe for vegetarians. Floradix is recommended especially for women including nursing and expectant moms. It is ideal for growing children, men and particularly those whose diet is deficient in Vitamins and iron. This food supplement does not contain alcohol or any kinds of additives or preservatives. 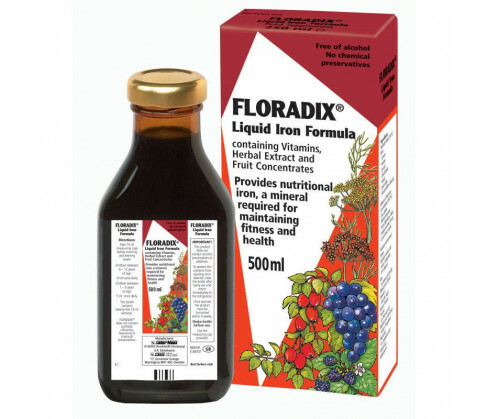 You may either finish consuming the contents within 4 weeks or discard Floradix Liquid Iron Formula pack after 4 weeks from the date you opened the pack. Avoid drinking directly from the bottle. Always ensure that the product is kept away from children. Recommended dosage for adults and elderly is 10ml twice daily. You should take it about half an hour before meals. You may give 5ml to children aged between 3-5 years only once daily. Children aged between 6-12 years should be given 10 ml once daily. Aqueous Extract (54%) from: Nettles, African Mallow Blossom, Carrots,Spinach, Fennel, Quitch Roots, Ocean Kelp, Fruit Juice Concentrates (29.4%): Grape, Pear,Blackcurrant Juice Water, Cherry, Orange, Blackberry, Red Beet, Carob Extract, Apple and Lemon, Aqueous Yeast Extract Honey, Aqueous Rosehip Extract comprising 4 per cent Vitamin C Iron Wheat Germ Extract Vitamin C, Ascorbic Acid, also, Natural Flavours Riboflavin (As Riboflavin Sodium Phosphate, Thiamin (As Thiamine HCI)) Vitamin B12 and Vitamin B6 (As Pyridoxine HCI).